91 seats. 21 states and Union territories. Aslam Hunani/Rediff.com gives the lowdown on the constituencies going to polls in the first phase on April 11. Elections to the 17th Lok Sabha kick off on April 11 with the first phase of polling. The mammoth electoral exercise spans five weeks, over seven phases, with the whole process culminating on May 19. There is a lot at stake for the two major national parties -- Bharatiya Janata Party led by Prime Minister Narendra Damordas Modi and Indian National Congress led by its president Rahul Gandhi -- that have been engaged in a no-holds-barred tussle for supremacy. In the first phase of polling, 91 seats across 20 states and Union territories are up for grabs. The states in which the polls will be completed in the first phase itself are Andhra Pradesh (25 seats), Arunachal Pradesh (2 seats), Meghalaya (2 seats), Mizoram (1 seat), Nagaland (1 seat), Sikkim (1 seat), Telangana (17 seats) and Uttarakhand (5 seats). Two Union territories of Andaman and Nicobar Islands (1 seat) and Lakshadweep (1 seat) will also be going to polls on the same day. The seven states in the region together have a representation of 25 members in the Lok Sabha. Out of this, in 2014 the BJP and the Congress had won 8 seats each, and the remaining 9 seats were won by regional parties and others. In the first phase, 14 of 25 seats from the north-east shown below will be going to the polls. The table below shows the seats which are going to polls in the first phase, the winning party in 2014 and the winning candidate. The southern state will see all its 25 seats going to the polls in the first phase. In 2014, The Chandrababu Naidu-led Telugu Desam Party had grabbed 15 seats of the 25, and YSRC came second with 8 seats and the BJP grabbed 2 seats. The Congress had failed to open its account in the state. Bihar has a total of 40 seats out of which only 4 seats are going to polls in the first phase. The elections in Bihar will last over all the seven phases. in 2014 the BJP had managed to grab 3 of the 4 seats going to poll, while the fourth was won by its ally Ram Vilas Paswan-led Lok Janshakti Party. In Chhattisgrah the BJP had won the Bastar seat in 2014. Its winning candidate had polled 385,829 votes against Deepak Karma (Bunty) of the INC who had polled 261,470 votes. There are 6 Lok Sabha seats in Jammu and Kashmir out of which only 2 will be going to polls in the first phase. In 2014 the PDP and BJP had won one each of these seats. Maharashtra has 48 Lok Sabha seats out of which 7 seats are going to polls in the first phase. The alliance of BJP and Uddhav Thackeray led Shiv Sena had managed to win all the 7 seats in 2014. 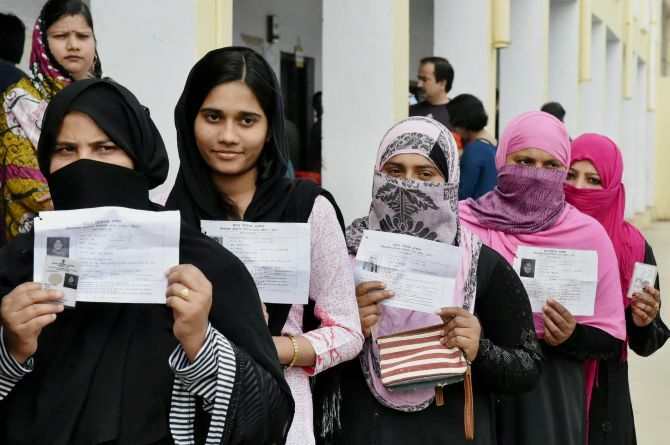 Odisha's 21 Lok Sabha seats will go to polls in four phases. In the first phase, 4 seats are going to polls, and all those seats were won by candidates of Biju Patnaik-led Biju Janata Dal in 2014. Telangana sends 17 members to the Lok Sabha, and the first phase of polling will cover all the seats. The state is currently being ruled by K Chandrashekar Rao led Telangana Rashtra Samiti. TRS had won 11 of the 17 seats in 2014, Congress had won 2, and the remaining 4 seats were won by the BJP, YSRC, TDP and AIMIM. The largest state of India sending the maximum number of MPs to the Lok Sabha will be going to polls in seven phases. In the first phase 8 seats will be going to polls. All the 7 seats going to polls in the first phase were won by BJP in 2014. For the 2019 election, Akhilesh Yadav-led Samajwadi party and Mayawati-led Bahujan Samaj party have formed a pre-poll alliance to take on the might of the BJP which had swept the state in 2014. As per the seat-sharing agreement reached between the two parties, of the the first phase seats BSP candidates will be contesting from Saharanpur, Bijnor, Meerut and Gautam Buddha Nagar seats, the SP will be contesting from Kairana and Ghaziabad while Ajit Singh led Rashtriya Lok Dal will be contesting from Baghpat and Muzaffarnagar. The state that is also known as Devbhoomi has 5 Lok Sabha seats and is currently governed by the Bharatiya Janata Party. In 2014, BJP had managed to win all the five seats in the state. This time it will be interesting to watching if the BJP is able to retain all the five seats. The lone seats in the Union territories of of Andaman and Nicobar Islands and Lakshadweep were won by BJP and NCP respectively in 2014.